This is a time of the ongoing ‘Troubles’ between the English and the Irish, a time when hunger strikes were taking place in the Maze Prison, the strikers demanding to be recognized as political prisoners, not as terrorists. A number of them will starve to death, while trying to force the hand of the British government. The Prime Minister of Britain, Margaret Thatcher, holds fast: A crime is a crime. For those unfamiliar with ‘the Troubles,’ there’s a timeline by Peter Taylor included at the end of this post that’s highly instructive. What follows next is a three-hour and fifteen-minute feast peopled by 31 characters, not counting a good-as-gold real-life 9-month-old baby, a fattened goose and a cuddly rabbit. The head of this family, the master of the house, is Quinn Carney (Paddy Considine), who like his brother, Seamus, had links to the IRA but broke with them to devote himself to maintaining his farm and looking after an ailing wife, Mary (Genevieve O’Reilly), and his six children. Also living under the same roof are Seamus’s widow, Caitlin Carney (Laura Donnelly) and her troubled son Oisin Carney (Rob Malone); Quinn’s Uncle Pat (Mark Lambert), Aunt Pat ((Dearbhla Molloy) and Aunt Maggie Far Away (Fionnula Flanagan). If Aunt Pat is a staunch Irish Republican resentful of the killing of her own brother years ago, Aunt Maggie, fitfully dozing in her wheelchair, comes alive to regale the children with frightening tales of the old days—of fairy warriors and banshees, those female spirits in Irish legends whose wailing warns of an impending death in a house. Don’t discount the warning! 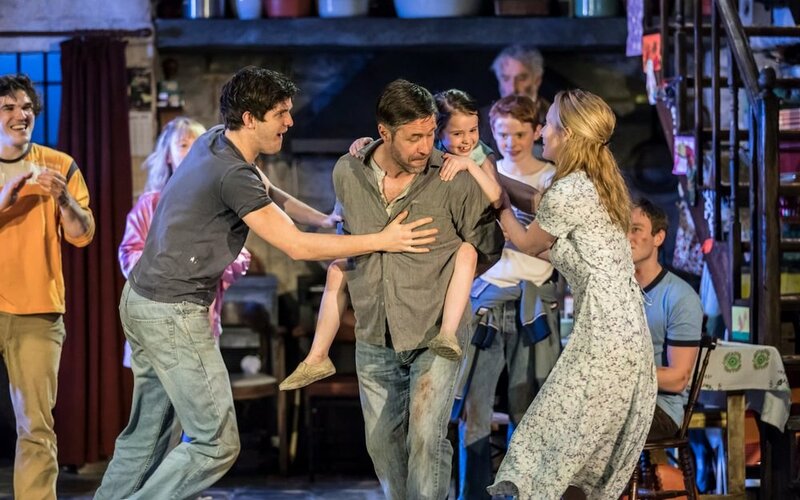 And don’t discount your confusion as the play opens with Quinn dancing wildly in the middle of the night in the kitchen with a woman we assume is his wife, but who turns out to be his sister-in-law played by Laura Donnelly who won an Olivier Award in 2017 for her performance in the original London production. In the first act, the playwright, Jez Butterworth, introduces us to a wide array of chatty characters, a number of whom have Irish brogues that I was hard-pressed to understand. (As were the attendees seated to my left and right.) Then again, I’m someone who watches English and Scottish films with subtitles. Fortunately, hard to understand is not the case with the principals, who are magnificent. As is the highly-charged second act laced with dazzling twists and turns. Not to be missed. And what’s the meaning of the title? Uncle Pat is reading Virgil’s The Aeneid, and it’s the ferryman who takes you across the river Styx to the underworld. This sprawling brawling tale incorporates love and hatred, life and death, comedy and tragedy, and violence and kindness. The plot is gripping, the cast universally excellent, and the atavistic fears and hatreds on display are sure to send a chill up your spine. Don’t take my word for it! “The best play of the century.”—Stephen Suskin, New York Stage Review. “This explosive, exhilarating drama is what a theater lover lives for.” —Peter Marks, The Washington Post. Coming to New York? Don’t delay in getting tickets. That’s all from your trusty correspondent for this week. If you’re saying to yourself ‘Wait a second, it’s not French!’ in a sense, you’re right. Then, again, it is universal. And I didn’t want you to miss out on this universal treat. Hope to see you back next week when I’ll have the coffee ready. Until then mes amis, may life be good to you. And remember: Sharing is Caring! Merci beaucoup.